MAPUTO, Mozambique, May 14, 2015 (ENS) – In the largest seizure of illicit wildlife products in Mozambique’s history, police Tuesday confiscated some 1.3 metric tonnes of elephant ivory and rhinoceros horn from a house in the southern city of Matola. The haul consisted of 340 elephant tusks and 65 rhino horns with an estimated street value of over US$6.3 million. The seizure resulted from a police operation involving 20 offices and a team from the Ministry of Agriculture’s forestry and wildlife department in this southern African country. Police arrested a Chinese national in Tuesday’s raid but have not released his name. Officials have now confirmed the arrest of a second Chinese national who went to police Wednesday claiming he was checking on the welfare of the arrested suspect on behalf of the Chinese Embassy. He put US$34,000 on the desk of the custody officer, asking that the suspect be released and the charges dropped. Police arrested him for bribery. 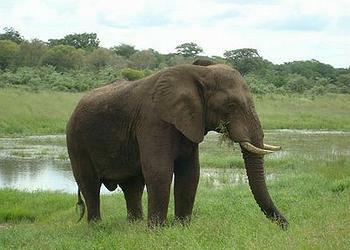 Police say the criminals were preparing to smuggle the ivory and rhino horns out of Mozambique. Since both species of African rhinoceros, the black and the white, are believed to be extinct in southern Mozambique, wildlife officials speculate that the 65 horns seized in Matola come from animals poached in neighboring South Africa, which has the world’s largest rhino population. 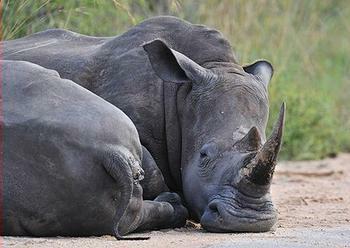 But South Africa is losing its rhinos to gangs of poachers. Last year, a record was set when 1,215 rhinos were killed in South Africa, and that figure could be even higher this year. Between January and April poachers killed 393 South African rhinos, an 18 percent increase over the same period in 2014. Outrage against poachers is growing, spawning concerted efforts to save Africa’s remaining wildlife by fighting back. Earlier this month, governments at the African Union-hosted International Conference on Illegal Exploitation and Illicit Trade in Wild Flora and Fauna in Africa in Brazzaville, Congo, issued a Declaration calling for international co-ordination and concerted response to the poaching crisis. Farther north, in the Ethiopian capital of Addis Ababa today, the international wildlife monitoring organization TRAFFIC hosted a workshop for Chinese businesses and citizens based in Africa to address the growing issue of illegal ivory trade. The event was organized in collaboration with the Chinese Embassy in Ethiopia and the Ethiopian Wildlife Conservation Authority. With direct flights to Asia, Addis Ababa is a key African transport hub , and Customs officers there have made many ivory seizures involving Chinese citizens returning home. Some 100 Chinese nationals from state-owned enterprises operating in Ethiopia and the local Chinese community attended today’s meeting. In his keynote speech, Chinese Ambassador to Ethiopia La Yifan urged close co-operation between the two countries to enforce international wildlife trade legislation under the Convention on International Trade in Endangered Species. He called for the Chinese community in Africa to obey the national laws of their African host countries. 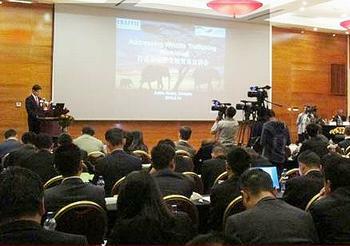 Today’s meeting in Ethiopia is the second outreach workshop for Chinese citizens in Africa. The first took place in Kenya in January 2014.